Doors play a more important role in decor than you might think. Just as updating your front entry door can make a substantial impact on your home’s curb appeal, updating your interior doors can make you feel like you’ve done a remodel. 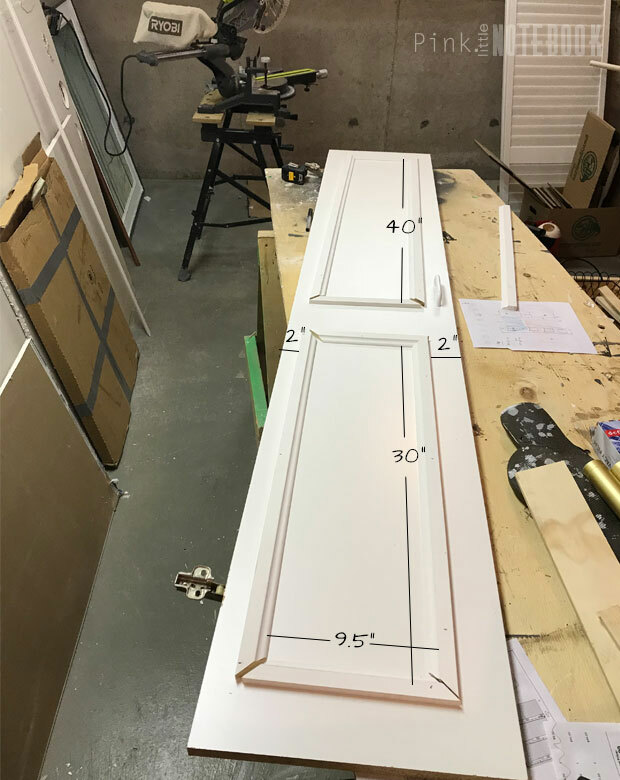 To get the look of costly paneled doors (without the expense), a little moulding, paint and new hardware can go a long way. Add style and detail to any of your doors with this quick and easy DIY project. 1. You want to choose a molding that accents but doesn’t overwhelm your interior doors. Measure and calculate the size of the frames that you need to make. 2. Cut your moulding pieces down to size for each door with a mitre saw and lay out your trim on the doors. Before you secure it in place, measure for even placement. *TIP* Use a nail gun to secure the moulding instead of wood glue. You eliminate any wait time. 3. Fill in the nail holes and any cracks in the corner with wood putty. Sand it all down once it dries. 4. 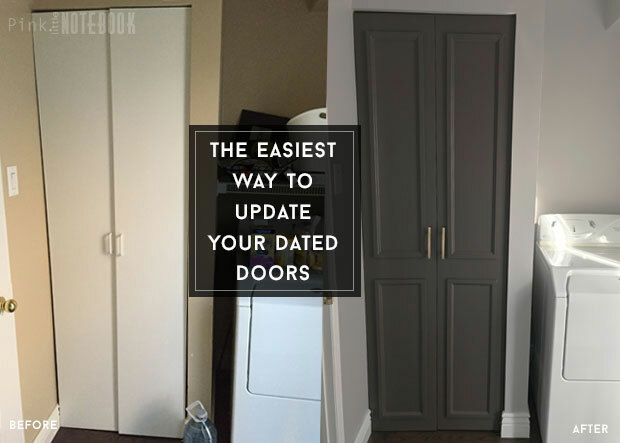 There is no easier or more impactful way to update your doors than painting them. To begin, use a primer to prep—a good primer is key to a great paint job. I used Para Paints Colour Boost Primer. *TIP* To paint both sides of the doors simultaneously, it’s better to have the doors on the hinges vs laying flat. It cuts dry time in half. 5. To get the ultimate surface protection and durability, it’s important to use paint specifically made for your surface. 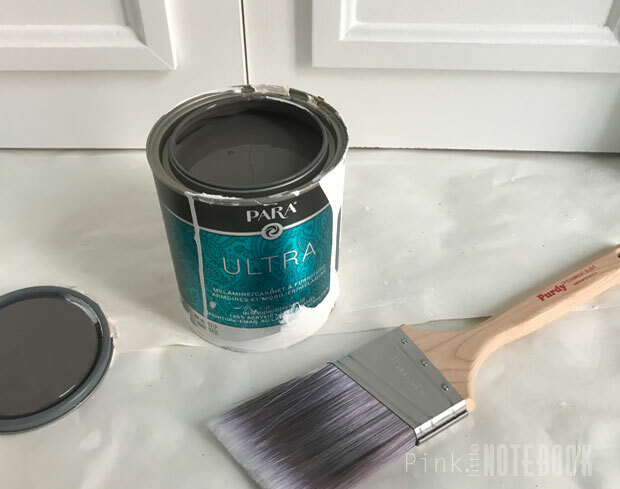 My go-to paint for furniture and doors is Para Paints Melamine, Cabinet and Furniture Paint (shown here in the colour Brushed Nickel, P5244-62). I apply my last two thin layers of paint with a high-density paint roller. 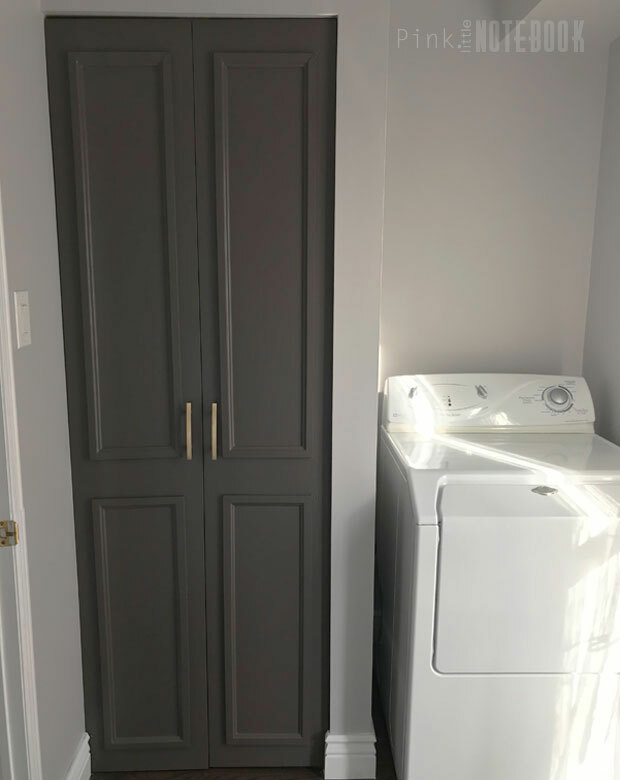 Paint alone always makes the biggest difference but add a little moulding and new hardware and you got yourself a brand new door. It’s such a quick and easy way to dress up those old doors. That really elevates the look of the space! I like the paint color you used. Wow, what a transformation! I love how updated these look! Thank you! I’m happy with the results. 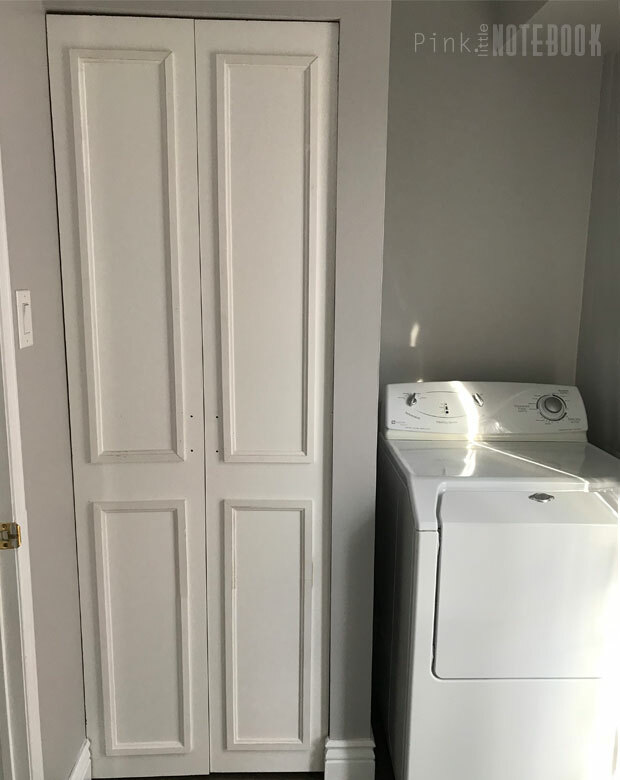 These doors look like they are brand new! WOW! This looks amazing! You did such a good job – what a difference! Oh wow, that makes such a huge difference! I love projects that can be completed ina weekend and completely elevate the look of a space. Me too! Weekend projects are the best. It’s instant gratification! This is a really awesome idea, and the transformation is fantastic. I love this easy DIY idea. Thanks! Thank you very much for post the article. Really, it’s very good. I learnt a lot about this. I’ll try to apply your ideas and tips. Love the quick and easy project, Sabrina! Did you have any issues re-hanging the doors on those %=÷$@#$÷! concealed hinges?? They were a bit finicky. We had to adjust them several times to line up the doors but eventually we got it. Love your renovation idea and make sense 😉 for the door. They look beautiful and very attractive. And definitely, all those credits go to you, Sabrina. You have a really good sense of design. Thank you so much, you’ve made my day!! This look amazing… Great work….